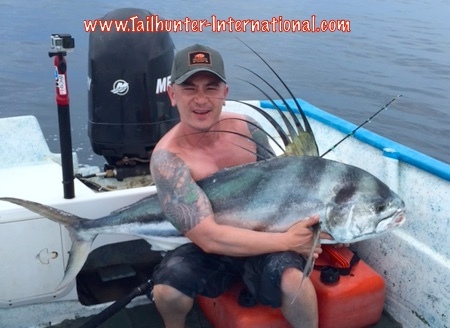 Dave Schneider from San Jose CA was fishing with us for the first time here in La Paz and put the hurt on this big boy roosterfish while fishing with our Tailhunter Las Arenas fleet. Great shot and he was able to release the big fish. Mommy-to-be, Tara O’Malley, only had one day to fish but went out with Captain Boli into La Paz Bay and got herself a limit of dorado of varying sizes. 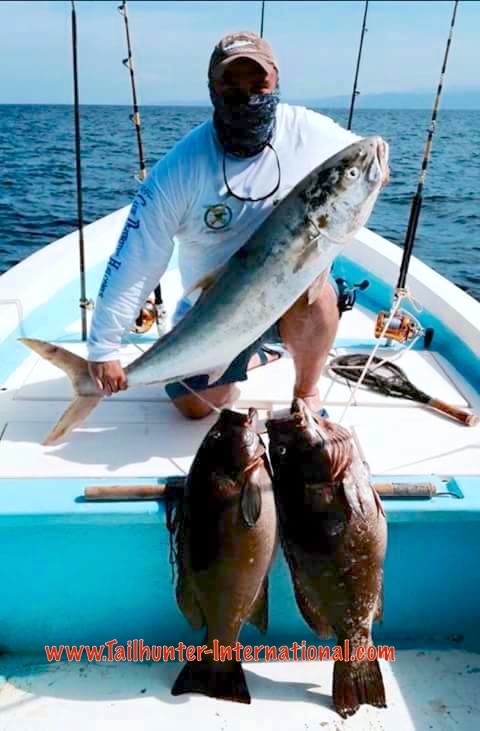 The man behind the mask is Jorge Santana with a real surprising catch for August…yellowtail and two trophy cabrilla. All those fish are normally caught when the waters are much cooler in the winter and spring. He was fishing deep off the Las Arenas lighthouse where there must be a current of cold water holding the fish. Captain Rogelio poses with Meng Foo and one of his several dorado he caught fishing north of La Paz near Espirito Santo Island. It’s so big I gotta sit down for the photo! 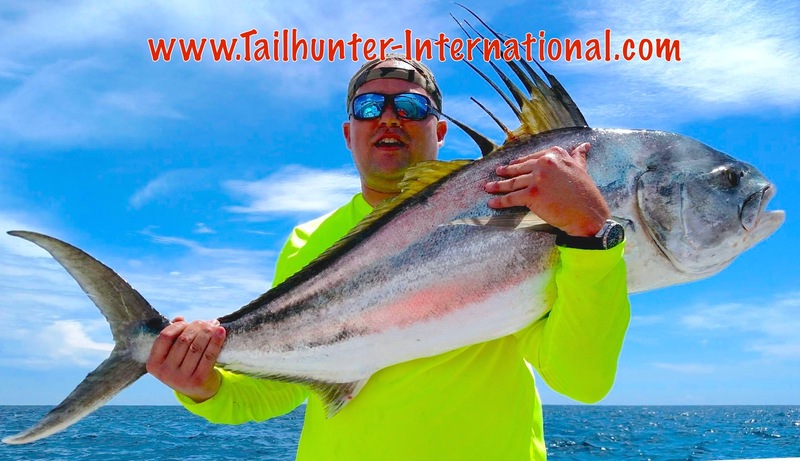 Kit Luu had a great day fishing with our Tailhunter Las Arenas fleet with fish like this trophy roosterfish he caught and released fishing with Captain Victor. 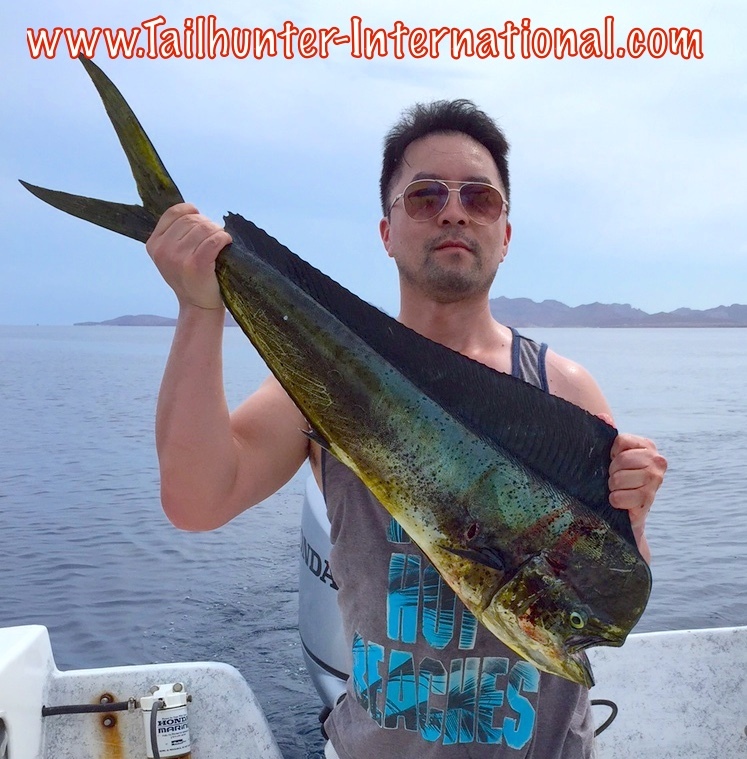 Thai Foo holds up a nice bull dorado that ended up being brought back to Tailhunter Restaurant to share with his amigos! 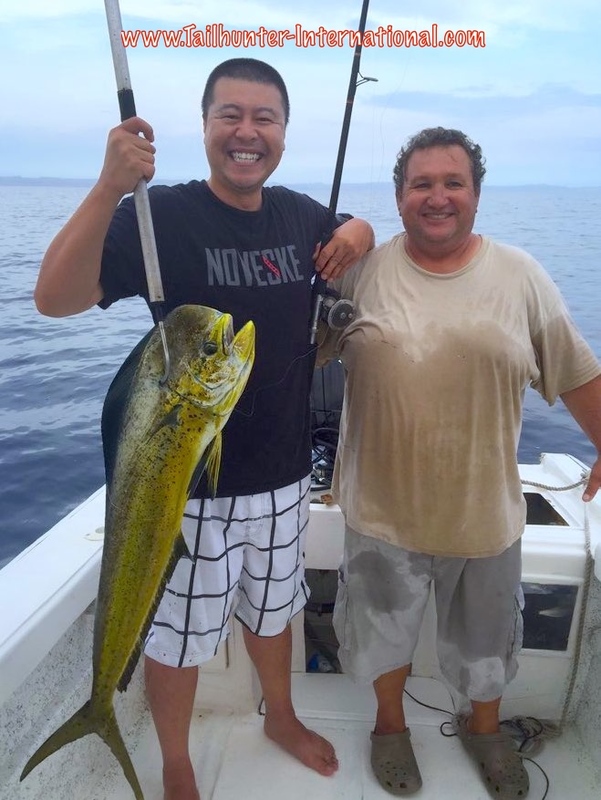 GOOD FISHING FOR DORADO AND ROOSTERS! The dog days of summer are here. It seems like almost every day is cooke-cutter. All the same! Sunny with temperatures in the high 90’s. Occasional tropical thundershowers in the afternoons or evenings that come and go. Sun pops back out leaving us with some spectacular sunsets. Kids are back in school so the waters and beaches are emptying out. Town is getting quiet again after the hubbub of summer vacation. Tourist families are generally gone as well for the same reason…school starts! So, mostly fishermen around. And the fishing is pretty good. Solid dorado fishing. Nothing wrong with that. Most days, all the action you could want. Good days to be on the water. There are some larger fish getting lost. But, it’s good to see larger fish around after a summer of so many little guys. They do grow fast! Again, there’s some huge bonito ripping things up as well. These fish fight like 30 pounders to most people although 12 pounds is about the true size. Same with the big jack crevalle schools near the beaches along with some smaller roosters. Hooked and lost several striped marlin this week again that bit light lines with live baits while fishing for dorado. The story continues to be rooster fish…big rooster fish in the area if you’ve ever wanted to nail one of these big exotic fish. They are close and still willing to hit a bait. They are almost all trophy-sized fish. Rarely are we getting any that are under 30 pounds and most are 40-60 pounders. All are getting released. Good to also see a few more dorado and other species popping up as well. The captains put out about 30 semi-permanent buoys just offshore to act as FADS (Fish Attraction Devices). And they’re working! Normally, there’s commerical buoys out there most of the season, but for whatever reason, there weren’t quite so many out there so the sportfishing captains put them out themselves. So, we’re seeing more dorado now…FINALLY and that might also have somethig to do with there being more bait available too. Bonito, jack crevalle and snapper rounded out the fishing. Again, just like last week, the surprise has been the yellowtail. These are COLD WATER fish. We get them in February to May…never in AUGUST! Right now, the air temps are 100. The water temps are 90. The only thing I can think is that off the Las Arenas lighthouse (where the fish are located), there’s a cold current down deep. No one is complaining. It’s a nice bonus. The ticket is finding mackerel either live or dead. And that’s not so easy either because the mackies are usually around in the cooler water as well. But, if you want a yellowtail and are willing to put in the time to catch a mackerel…a hour or two to catch a few…it’s spot-on for hooking a forkie right now. Big shout out to our “Pack for a Purpose” good guys. Brian and Marie McClanahan and Kip and Sue Slaugh all from the Salt Lake City area in Utah, hauled down several duffle bags filled with school supplies, health products (toothbrushes), notebooks, backpacks and other much-needed things for our kids. Vong Mekdara also carried down a load of stuff. 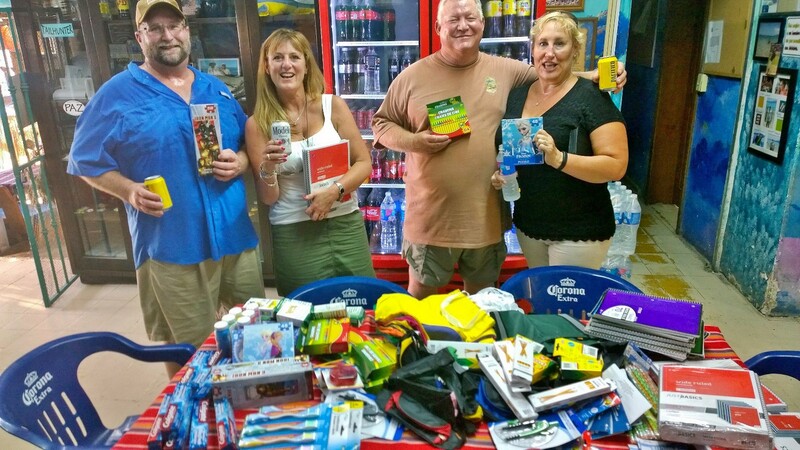 As well, Steve Hartsook and Mike Jordan who have been visiting us for years filled up with great kid’s stuff. (Photographer’s error…the photo didn’t come out…but they deserve a big shout out too!) Just in time since the school year is just starting down here and many kids don’t even have pencils. We’re grateful for all the many many amigos and clients who have brought stuff over the months for the orphanage, schools and women’s shelters. You’re the best! The McClanahans and the Sloughs! Thank you! 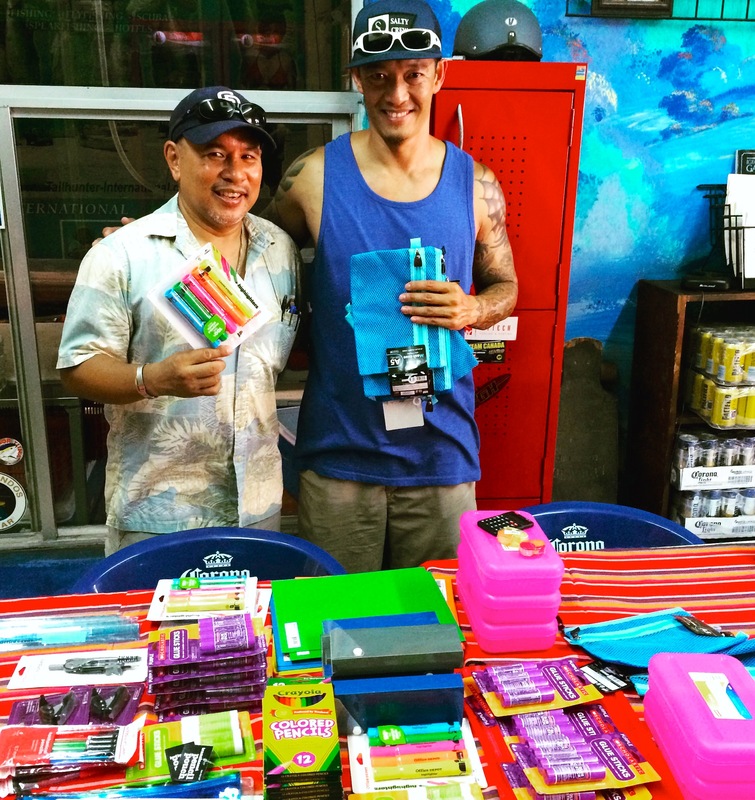 Vong Mekdara from Monterey Park CA brought everything from pencil boxes to batteries and staplers to white glue! It’s not good for the Mexican economy, but great for tourists. The Mexican pesos is dropping dramatically this year and seems to keep falling. The current peso-to-dollar exchange rate was at 14…15…16..17 and might go as low as 18:1 (pesos to dollars). That means that the purchasing power for tourist holding pesos is pretty good and makes Mexico a great vacation value. For example, two years ago when things were at 10:1 (ten pesos per dollar), a cab ride costs, for example 100 pesos (10 dollars). That same cab ride now at 100 pesos means it’s now only costing about 6 or 7 dollars! A restaurant meal that cost $200 pesos or a t-shirt for $200 that was easy…it was $20 dollars U.S. Those same items now would be only $12 or $14 dollars. The downside is for something like say…tips for captains. If you are used to giving your regular guy $400 pesos ($40 U.S. dollars) if you hand him 400 pesos now, you might get a little look of disappointment since now you are only tipping about $25 or 26 U.S. dollars. So, give some consideration to changing your dollars to pesos when you’re at the airport or go to a money exchange place when you get to town.